Smileworks are delighted to accept referrals from local Private and NHS practices for a number of areas of practice and specialist procedures. Sometimes patients require a fuller scope of treatment. Here at Smileworks we are a multi-disciplinary practice and can give patients the full scope of treatments you want them to have. If you’re lost and are actually looking for our recruitment page then you can all the posts below right here: dental jobs in Liverpool. We take the frustration out of referring for specialist treatment. Whether it’s long waiting times, muddled processes or hidden costs, there always seemed to be an added layer of stress during the referrals process. Here at Smileworks we will make the process painless. You will enjoy peace of mind that your patient is in the best hands while being able to easily access comprehensive price lists, a clear and concise referral process and the promise that your patient will be cared for and returned to you happy. Dr Rowland-Warmann is available for root canal referrals and we have a microscope and CBCT scanner to assist with the efficacy of clinical outcomes. She has also written an academic article on the future of CBCT imaging in root canal treatment. Here at Smileworks we believe that patients deserve the right to smile with confidence and feel positive, happy and beautiful. We have brought together some of the best dentists and specialists from throughout Europe to fulfil this vision. 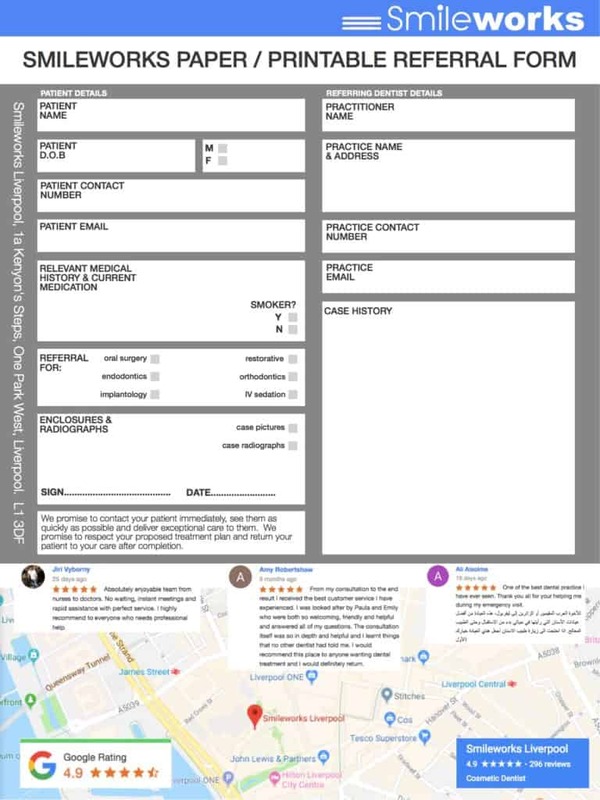 Smileworks are the referral partner for a growing number of both private and NHS practices and we have built up a reputation for honesty, straight-forward dealing and a hassle-free referral process. We adhere to strict referral rules and promise to deal with your patient in a quick, transparent and efficient way. You can read more about the Smileworks referral promises below. 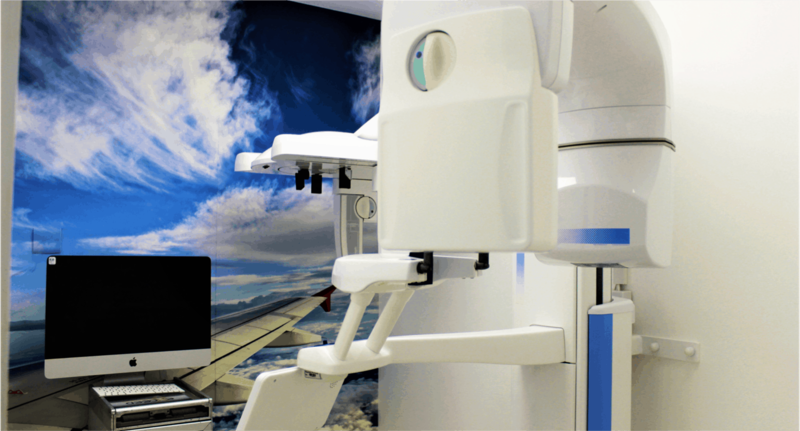 As well as being able to get a fast appointment, your patient will be able to take advantage of our brand new CBCT scanner, a range of the highest quality materials and latest technology, late opening times (including Saturday opening), patient finance and our legendary customer service and attention to detail. Krishan has over 7 years’ experience in placing and restoring implants, treating simple to complex cases with ease. He is an active member of the Association of Dental Implantology (ADI), International Team for Implantology (ITI), Society for Advancement of Anaesthesiology in Dentistry (SAAD), Royal College of Surgeons (RCS) and the British Dental Association. 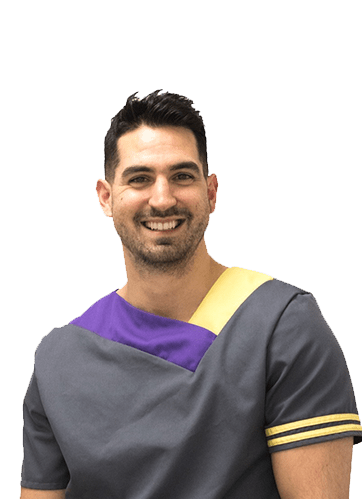 He has surgical and restorative experience with all major implant systems including Straumann, BioHorizons, Astra, Ankylos, 3i and Nobel Biocare. In addition to his MSc in Implantology, Krishan has been involved in training at the Kois Centre in Seattle over several years and has an unwavering commitment to professional development. Krishan places over 500 implants per year and has a wealth of experience in single tooth implants, mixed cosmetic veneer/crown/implant cases, implant retained dentures and full-arch restoration including immediate loading (All-on-4 or Smile in a Day). He also provides sedation for nervous patients and manages them with ease. He has a keen interest in digital treatment planning and his meticulous approach to implantology means he delivers the highest standards in patient care. Smileworks accept referrals from you for orthodontic treatment of adults and children. Laurence is on the General Dental Council’s Specialist list and is an active member of the British Orthodontic Society (BOS), American Association of Orthodontists (AAO), International Association of Orthodontists and Implantologists (iAOI) and Fellow of the World Federation of Orthodontics (WFO). Laurence is a certified provider of Invisalign, Incognito and WIN lingual braces. He is constantly enriching his orthodontic knowledge and has recently finished the prestigious FACE/Roth-Williams advanced multidisciplinary postgraduate course in San Sebastian, Spain. He is one of the only specialists in the UK to have had the honour of being part of this illustrious group of Orthodontists. Laurence is meticulous in his approach to diagnosis and case planning. His vast knowledge in his field makes sure that his patients get the very best standards of care and results. Laurence regularly attends conferences and courses so that he can remain at the absolute cutting edge of his profession. He has a special interest in digital orthodontics and new contemporary technologies associated with the speciality. If you are in doubt as to whether you should refer a case, please send it anyway. 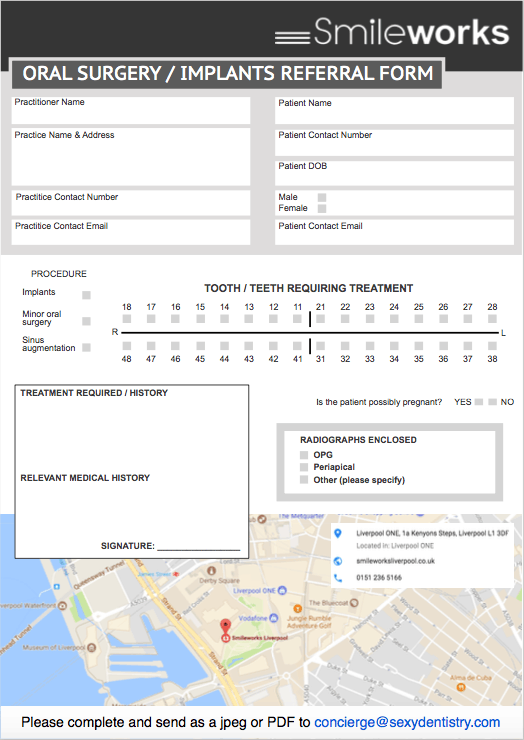 If the patient needs an onward referral for orthognathic surgery, we will handle this for your patient. Billy is remarkable clinician. He is an active member of the British Academy of Aesthetic Dentistry (BAAD), British Society of Restorative Dentistry (BSRD) and British Dental Association and been published a number of times. 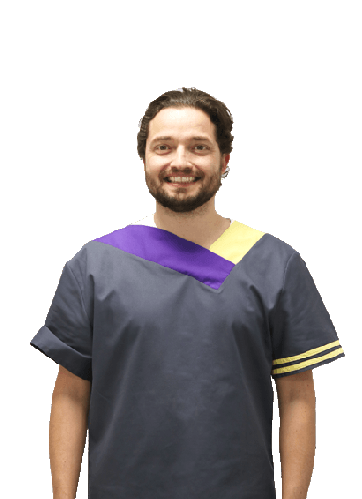 Billy is a lecturer in Clinical Photography on a number of eminent courses throughout the UK and Europe and teaches clinicians in Composite Veneer Dentistry Masterclasses worldwide through his affiliation with Tokoyama as one of their Key Opinion Leaders. His commitment to professional development seemingly knows no limits; he has trained with the eminent Christian Coachman in Digital Smile Design and has recently trained in Advanced Aesthetic Dentistry and periodontal surgery in Turkey, Hungary, Germany and Italy. In addition to his role at Smileworks, Billy is a Specialty Restorative Dentist at the Manchester Dental Hospital, where he treats a variety of very complex prosthodontic patients including tooth wear, restoration of implants and edentulous/partially dentate patients. His faultless approach to even the most complex restorative cases means he can deliver exceptional results both functionally and aesthetically in order to restore the patient’s smile. Smileworks are proud to be able to provide an imaging referral service for your patients. Our state of the art Planmeca CBCT provides the highest quality images possible in order to assist in the diagnosis and treatment planning of your patients from implants to extractions. Whether 2D or 3D imaging, your patients will be seen within 24 hours (same day if needed). The images will be processed and sent to you electronically within 24 hours of the patient attending (immediately if required). We are able to provide you with low to high resolution imaging depending on your reason for referral (Orthodontic/Implant/Endodontic) and can scan single arch, dual arch or specified individual teeth depending on your patient’s treatment need. For CBCT referrals, you will receive the Romexis viewing software and any support you may need free of charge. 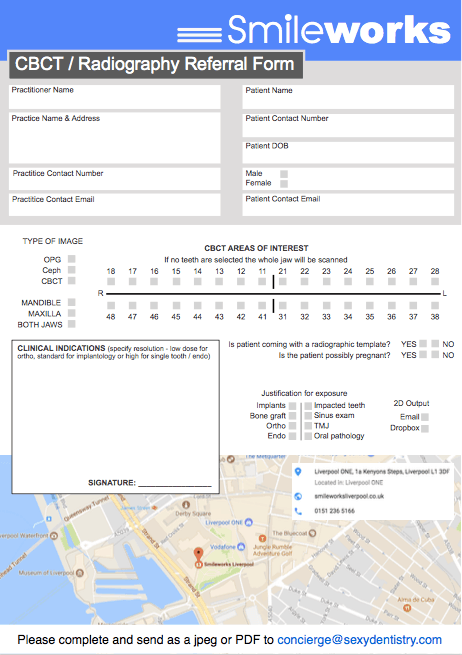 Please use this section to upload radiographs, medical history or any other documents relevant to your referral.